A distinguished Shakespearean scholar found tortured to death . . .A lost manuscript and its secrets buried for centuries . . .An encrypted map that leads to incalculable wealth... 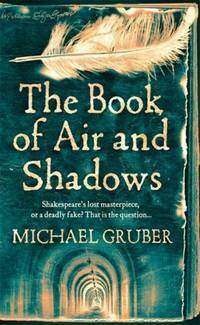 The Washington Post called Michael Gruber's previous work "a miracle of intelligent fiction and among the essential novels of recent years." Now comes his most intellectually provocative and compulsively readable novel yet.Tap-tapping the keys and out come the words on this little screen, and who will read them I hardly know. I could be dead by the time anyone actually gets to read them, as dead as, say, Tolstoy. Or Shakespeare. Does it matter, when you read, if the person who wrote still lives?These are the words of Jake Mishkin, whose seemingly innocent job as an intellectual property lawyer has put him at the center of a deadly conspiracy and a chase to find a priceless treasure involving William Shakespeare. As he awaits a killer—or killers—unknown, Jake writes an account of the events that led to this deadly endgame, a frantic chase that began when a fire in an antiquarian bookstore revealed the hiding place of letters containing a shocking secret, concealed for four hundred years. In a frantic race from New York to England and Switzerland, Jake finds himself matching wits with a shadowy figure who seems to anticipate his every move. What at first seems like a thrilling puzzle waiting to be deciphered soon turns into a dangerous game of cat-and-mouse, where no one—not family, not friends, not lovers—is to be trusted.Moving between twenty-first-century America and seventeenth-century England, The Book of Air and Shadows is a modern thriller that brilliantly re-creates William Shakespeare's life at the turn of the seventeenth century and combines an ingenious and intricately layered plot with a devastating portrait of a contemporary man on the brink of self-discovery... or self-destruction. 2007-08-04. New. Ships with Tracking Number! INTERNATIONAL WORLDWIDE Shipping available. Buy with confidence, excellent customer service! 2007-05-15. New. Ships with Tracking Number! INTERNATIONAL WORLDWIDE Shipping available. Buy with confidence, excellent customer service! 2007-08-04. Good. Ships with Tracking Number! INTERNATIONAL WORLDWIDE Shipping available. May not contain Access Codes or Supplements. May be ex-library. Shipping & Handling by region. Buy with confidence, excellent customer service! 2007-05-15. Good. Ships with Tracking Number! INTERNATIONAL WORLDWIDE Shipping available. May not contain Access Codes or Supplements. May be ex-library. Shipping & Handling by region. Buy with confidence, excellent customer service! Morrow, 2007. Book. Near Fine. Hardcover. Signed by Author(s). First Edition. Hardcover in jacket. Top corner very lightly bumped.. Stated first edition with the complete number line; signed and dated with a blurb by the author on the title page. Fine in fine dust jacket with no apparent flaws; in archival protection. New York: William Morrow, 2007. First Edition, First Printing. Hardcover. Large octavo; VG/VG; greenish-tan spine with black and brown text; jacket has protective mylar cover; boards are strong and clean; textblock is clean; pp 466; signed by author on title page. Full-priced Rockville. 2007-03-08. Good. Ships with Tracking Number! INTERNATIONAL WORLDWIDE Shipping available. May not contain Access Codes or Supplements. May be ex-library. Shipping & Handling by region. Buy with confidence, excellent customer service! New York: William Morrow & Company, 2007. SIGNED by the AUTHOR on the Title page. Signature only A First edition, First printing. Book is in Near Fine condition. Boards are clean, not bumped. Fore edges have a tiny bit of shelf wear. Interior is clean and legible. Not remaindered. Dust Jacket is in Near Fine condition. Not chipped or crinkled. Not price clipped. Dust Jacket is covered by Mylar Brodart. All-Ways well boxed, All-Ways fast service. Thanks... Signed by Author. First Edition. Hard Cover. Near Fine/Near Fine. New York: William Morrow, 2007. 466 pages. Copper lettering on the spine. Dust jacket is protected in Brodart. A fine, unread, copy of this novel, signed by the author on the title page in black ink. . Signed. First Edition. Black and brown Cloth Hardcove. Fine/Fine. 6 x 9. Fiction. William Morrow Paperbacks, 2008. Paperback. New. 8 x 5.31 cm. Tantor Audio. MP3 CD. 1400154499 *LIKE NEW* Ships Same Day or Next! . Fine. Tantor Audio. MP3 CD. 1400154499 *BRAND NEW* Ships Same Day or Next! . New. New York: Morrow, 2007. First Edition. Hardcover. Fine/fine. First Edition. Hardcover. HarperCollins. Used - Good. Shows some signs of wear, and may have some markings on the inside. 100% Money Back Guarantee. Shipped to over one million happy customers. Your purchase benefits world literacy! New York: William Morrow, 2007. 1st. Hardcover. Fine/fine. Bound in the publisher's original quarter cloth and paper covered boards. New York City: William Morrow, 2007. 1st Edition. Hardcover. Fine/Fine. 8vo - over 7¾ - 9¾" tall. First printing. U.S.A.: Findaway World, 2007. Audio Book. Good. preloaded_digital_audio_player. PLAYAWAY ** DIGITAL AUDIO PLAYAWAY EDITION ** withdrawn from the library collection. A PLAYAWAY is a Compact Digital Audio Player already pre-loaded with your audio book. PLAYAWAY IS EASY TO USE! Just plug in the earphones, press the power button ON and begin to listen and enjoy. Included is a NEW BATTERY and NEW EARBUDS. Light weight with a powerful purpose. Take along on your next journey. Makes a sensitive get well gift! Enjoy the convenience and versatility of the PLAYAWAY for all your travel and leisure needs..
Harper. PAPERBACK. B002671IZQ . New. Harper. PAPERBACK. B002671IZQ Remainder mark . Fine. Harper. PAPERBACK. B002671IZQ signs of little wear on the cover. . Very Good. Harper. PAPERBACK. B002671IZQ Minor shelf wear . Very Good. New York: HarperCollins, 2007. Gruber's fifth book is a bibliomystery set in New York, England and Switzerland as a fire in an antiquarian bookstore reveals a 400-year-old cache of letters that thrusts Jake Mishkin, an intellectual property lawyer, into a frantic and deadly chase after a lost Shakespearean manuscript and an encrypted map leading to almost unimaginable wealth. Inside front cover shows three small and faint pen marks, o/w boards and text are clean, tight, square; the dustjacket has a small area in upper right corner of the front panel where clear coating was damaged with removal of a price sticker and a three-inch tear starting at the top edge of the back panel and running along the fold between the back panel and flap (the tear has been carefully repaired from the inside with archival-quality tape), o/w only minor surface and edgewear. . First Edition, First Printing. Hard Cover. Near Fine/Good. New York, New York, U.S.A.: William Morrow, 2007. Very good. Hard cover, fiction, England, Switzerland.. Hard Cover. Very Good/Very Good. HARPER. PAPERBACK. 0061456578 . New. William Morrow. Hardcover. 0060874465 American first edition, first printing. Contains number line 1 2 3 4 5 6 7 8 9 10. Virtually no wear to jacket. Jacket is NOT price clipped. Covers are clean and bright. Edges are sharp. No tears or creases. The book itself is in Near Fine condition. The binding is straight and tight. No remainder mark. All books are marked down 35% until February 1, 2019. Start stocking up now! . Fine. HARPER. PAPERBACK. 0061456578 Remainder mark . Fine. Avon A. Reprint. Literature & Fiction. New. Brand New: This item is brand new unopened, never used and still in its original manufacturer condition. HARPER. PAPERBACK. 0061456578 Special order direct from the distributor . New. William Morrow and Company, Inc., 2007 Very good in wrappers. Advance Reader's Edition. First edition stated on the copyright page.. 1st Edition. Soft cover. Very Good/No Jacket. William Morrow, March 2007. Hardcover . 7.5 Bulk HB Standard. William Morrow, 2007-03-27. 1. Hardcover. Used:Good. NEW YORK: HARPER. VG IN WRAPS. LIGHTLY WORN. Pages: 466. . 2009. TRADE PAPERBACK.. Condition: VG IN WRAPS. LIGHTLY WORN. Pages: 466. Harper Paperbacks, March 2008. Trade . 4 PB Extra Nice +5%. New York: William Morrow, c2007. 3rd printing. Hardcover. Fine condition/very good. 466pp. 24 cm. William Morrow Paperbacks, 2008-02-26. Reprint. Paperback. Used:Good.